Sous vide ribs cover a wide range of cuts and many different meals. From baby back ribs to short ribs, we try to cover all the information you will need to know to successfully cook sous vide ribs on your own. Most pork sous vide ribs are cooked at 135°F / 57.2°C for medium rare or 141°F / 60.5°C for medium. 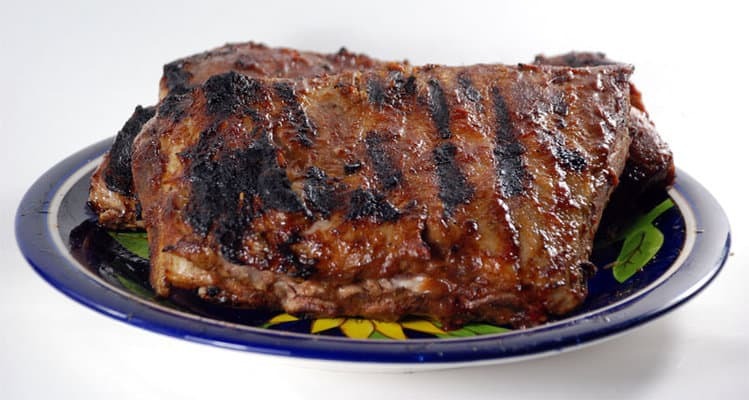 Baby back, St. Louis, and country style ribs are typically cooked for 8 to 12 hours but can be done for up to 24 if you prefer them really tender. Sous vide spare ribs are usually cooked for 12 to 24 hours since they tend to be a tougher cut. If you prefer a more traditional texture to your pork sous vide ribs you can cook them at 155°F / 68.3°C. They will be drier than the lower temperatures but will be closer to a traditionally cooked rib. Sous vide short ribs are held up as how amazing sous vide can be often times. This is because short ribs are composed of very tough meat and in order to tenderize them enough to eat you have to raise them to a high enough temperature to break down their collagen but with sous vide you can keep them medium-rare and they will not dry out. Most sous vide short rib recipes are cooked at 131°F / 55°C for medium rare or 141°F / 60.5°C for medium and they are cooked for 2 to 3 days. For a more traditionally braised texture cooking temperatures of 156°F / 68.8°C or 165°F / 73.8°C are used for 1 to 2 days. This results in a more traditional texture and most sous vide short ribs will be meltingly tender. Temperatures around 131°F / 55°C for medium rare or 141°F / 60.5°C for medium are often used for sous vide beef ribs. The beef ribs are typically cooked for 2 to 3 days, depending on the specific cut.